It should be expected that when I get around to reviewing Dark Matter, reviewing Killjoys won't be too far behind as the shows have enjoyed a similar release schedule through SyFy. And to be fair, the main thing that tied them together for me was just their initial release and how they were both science fiction themed. But Killjoys always tried to be the wittier one as you do follow a group of rogues flying around the galaxy as they pursue their bounties. But of course there was more to their story than just being bounty hunters and the first season did a good job of giving them a bit more substance as characters. Then they also tacked on this big conspiracy sub-plot that tried to come to more of a head in the later half of the first season and this time around they try to explore that story a lot further in order to really push things along. The end result is a pretty distinct science fiction television experience with a decent enough crew camaraderie vibe. 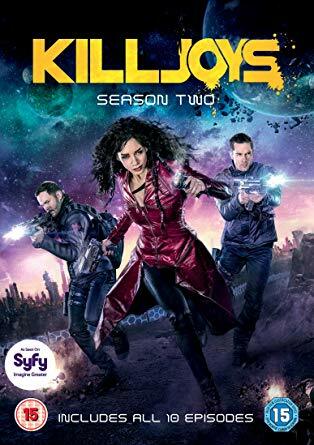 Synopsis: Killjoys is a Canadian science fiction adventure television series created by Michelle Lovretta. As of the time of writing of this blog post, the show has already been confirmed for a fifth season in 2019. The season begins with D'Avin (Luke Macfarlane) locked up in some sort of laboratory facility where he is being subjected to treatments with an unknown green substance. The whole time he's locked in some comatose-like dream state. Elsewhere, Dutch (Hannah John-Kamen ) and Johnny (Aaron Ashmore) are on the practically sentient starship Lucy (Tamsen McDonough) while in orbit around Arkyn, where they suspect D'Avin is being held. But the planet is protected by a particular energy shield that Lucy can't seem to penetrate. Whether or not they will rescue D'Avin is really a question from a television narrative perspective but they do get him out of there in a surprisingly quick manner. His escape from the facility also sets up the larger conspiracy related to the green plasma substance that was being used on him and may be related to the Level 6 Killjoys who seem to possess augmented abilities. At the same time there's still the question of Old Town, which is now confined within an energy barrier with little to no support from the outside world. What I Liked: It took me a while to get onboard with the whole green plasma story but admittedly this plot point developed into something fairly intriguing and progressed in a fascinating way. I guess it just goes to show that even a seemingly silly plot line can be given a lot of value with sufficient care and attention. The I guess it's not quite as silly anymore after all that. Illenore (Sarah Power) got a lot of great character development in this season beyond being Johnny's odd little love interest who just happens to be corporate royalty working in a doctor in Old Town. This season really tried to elevate her into something more as she confronts her family and tries to turn things around to help support Old Town on a larger scale. What Could Have Been Better: There felt like a bit of an effort to give more flavor to Pree (Thom Allison) as he had to tag along with the Killjoys for a while, but in the long run he just goes back to Old Town and that's that. I was initially intrigued and wanted to see where this might go had it been allowed to progress further as he is an interesting character at times. But it didn't get developed and so he now just feels like a deliberately cool concept of a character instead of a fully fleshed one. Dutch's character development also felt a little slow in this season as the larger plot centered around the green plasma and her former mentor Khlyen Kin Rit (Rob Stewart) sort of swallowed her up. And thus it was less about her character and personality and more about what had been done to her by all those different people over the years. And that felt like a shame as well because she is one of the leads and yet a lot of the stuff happens to her and not because of her, if you get my drift. TL;DR: Killjoys is still a decent amount of fun and the smaller core cast does help keep the stories very character-focused. The larger story still has its hits and misses but you do feel the show is distinctly building up to something. Thus the second season gets a good 4 strange green goo creatures out of a possible 5.